Alloy chassis Zenoah 1 pce. Side guards l./r. each 1 pce. Brake power adjusting screw, 1pce. Distance disk for servo saver axle,1pce. FG Ball-and socket joint 6mm w. ball, 6pcs. FG Steel ball 6 mm, 5pcs. Track rod right/left 1:6, 74mm, 2pcs. Ball-and-Socket Joint 10 mm for M6, 4pcs. This part has been replaced by 06029/07. Ball-and-Socket Joint 10 mm for M8, 4pcs. This part has been replaced by 06029/08. Ball-and-Socket Joint for M6, Adjustable, 4pcs. Ball-and-Socket Joint for M8, Adjustable, 4pcs. Steel balls 10 x 10,75, 4pcs. Brace f. roll cage long/short, each 1pce. FG Wing mount, Used with the mounting of the Monster Truck body and other Off roads like the Hummer etc..1pce. Stiffening brace f. Monster Truck, 2pcs. Plastic part f. stiffening brace, 2pcs. Ball Bearing, 10x19x7, with Grease Filling, 2pcs. This part has been replaced by 06036/05. Bolts for gear unit, 1pcs. 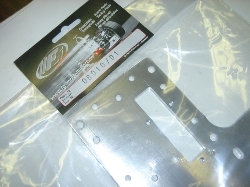 Brake plate and square, 4pcs.